Welcome to the 31 Days of Wrestling, ladies and gentlemen. It's that time of year again when we take a look back at the past 11 months of pro wrestling (and as much as possible, the last month as well) and cherry-pick one match a day for each day of December from a list of bouts that defined the year in our beloved sport. Most matches will be good, while some may not be; what matters is that they helped build the perception and reputation of the kind of wrestling this calendar year produced for us. Today's entry is a tale that hits a little close to home— the tale of how one Pinoy Boy made his mark in professional wrestling. Earlier this year, the WWE made history when it announced that it would be hosting the WWE Cruiserweight Classic. 32 of the world’s finest were be invited to compete in a knockout tournament to determine who was the best cruiserweight in the world. For wrestling fans like you and me, this meant that we’d get to see some of the very elite on WWE programming—and get some awesome matches out of it. 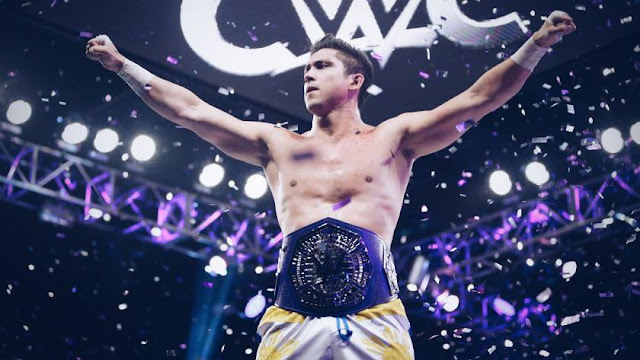 So when Fil-Am wrestler TJ Perkins was announced as a participant in the WWE Cruiserweight Classic, almost no one expected him to win the whole thing. Sure, Perkins was a well-seasoned veteran and he had far more mileage than a good chunk of the field, but there was no way he’d get the nod over the big names. Surely, this tournament was for the Zack Sabre Jrs. and Kota Ibushis of this world to win, and we’d all have to settle for TJP to just have a decent run. Or so we thought. Perkins defeated German upstart Da Mack in the first round, but was not a popular pick to win his next match against Johnny Gargano. Surely Gargano, who was already signed with the WWE and had started to gain in NXT, would advance over the outsider? One crash to the outside and a kneebar later, and it was Perkins who was move forward. Cue surprise from the wrestling world. In the quarterfinals, Perkins squared off with the flashy Rich Swann. Swann was in a similar situation as Gargano, and had yet to have his breakout moment in the WWE, so people thought that the Cruiserweight Classic would be his statement victory. This was it for Perkins, said many a fan. Instead, Perkins got down to work, dabbed on Swann, and made him submit to the almighty kneebar. Our boy was now in the semifinals, and it started to look like he had a shot at this. All eyes were now glued onto the finale of the Cruiserweight Classic to see if Perkins could go all the way. Japanese sensation Kota Ibushi awaited in the semifinals, having made his way there as one of the favorites to win it all. You see, Ibushi was to thank for some of the best wrestling in the last few years. In his time at NJPW, he put on showstopper after showstopper against the likes of Shinsuke Nakamura, Tetsuya Naito and AJ Styles. He blazed through the tournament as many expected him too, including putting on an absolute classic against Cedric Alexander in the second round. As would be the trend with Perkins’ entire run, he was not a favorite here. In this 15-minute span, Perkins and Ibushi put on one of the best matches of the year. Kicks and flips were traded hard as both men sought to continue on to the finals. For every strike Ibushi hit, Perkins came back with one of his own. Perkins tried to lock in his signature kneebar several times, but Ibushi always found a way to escape. When Ibushi nailed the Golden Star Powerbomb, however, many thought it was the end. Like many a Filipino sports team, Perkins willed his way back into the match. That indomitable fighting spirit roared to life as he continued to battle Ibushi. Eventually, TJP locked in the kneebar one more time, and after locking in Ibushi’s head as well, managed to make the Japanese star tap out. As TJ Perkins basked in the glory of what he had just accomplished, a WWE interviewer came up to him and asked him for his thoughts. He replied with the classic Zen proverb: “Before enlightenment, chop wood, carry water. After enlightenment, chop wood, carry water.” He knew that his job wasn’t done yet, and that he had to win one more match. He faced the crown jewel of lucha libre, Gran Metalik, in the final—a fitting final boss for this shot at glory. Like Ibushi before him, Metalik took Perkins to the limit. He painted TJP’s chest red through a variety of kicks and aerial offense, and seemed ready to put an end to Perkins’ run. As Metalik brought him up top for the final Metalik Driver, Perkins came to life once more—one more kneebar for the win! As soon as Gran Metalik’s hand hit the mat, TJ Perkins had achieved a lifelong dream. Overall, the entire WWE Cruiserweight Classic can be considered a highlight. For the first time in a long, long time, WWE acknowledged the wrestling world beyond its borders and let them compete in a WWE ring. Matches that only existed on fantasy booking posts actually happened this year, and professional wrestling has come off better as a whole because of it. It’s been one hell of a 2016 for everyone who loves wrestling. But for us Filipinos, the biggest victory was seeing TJ Perkins win it all. It was seeing someone who, like many a Filipino citizen, had to struggle and claw his way to make it to the top. It was seeing this man who toiled around Japan and America, working for promotion after promotion, finally make his mark on the biggest stage of professional wrestling. It was seeing a veteran defy the odds and prove his critics (several of us Filipinos included) wrong when he went up, and defeated, some of the very best wrestlers in the world today. These days, we use the term “Pinoy pride” to mockingly refer to the Filipinos’ penchant for latching on to anything that remotely smells Filipino. TJ Perkins may not have spent his entire life in the Philippines, but he willingly honored his roots as he wore the country’s flag on professional wrestling’s biggest stage. That, folks, is something we Pinoys should absolutely be proud of. TJ Perkins had two streaks going in this tournament. One, he was always the underdog. Two, he did not stop winning. 31 Days of Wrestling is Smark Henry's way of celebrating the matches that helped define wrestling in 2016.